Clean, pure water is a priority for all fish. No equipment is more effective in helping create ideal water conditions as Reverse Osmosis (RO) units. These units filter out up to 99% of chemicals found in tap water by forcing tap water through a semi-permeable membrane that removes 90-99% of tap water impurities. The result is water that is free of minerals and other contaminants. 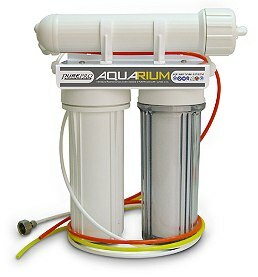 Our Aquarium RO Systems meet stringent standards and far exceeds the quality of systems from other manufacturers. A wide variety of options ranging from economy 3-stage units to top of the line 5-stage RO/DI units are available to suit your exact needs. Why do I need RO water ? Three Color Coded Tubing For System Connection. Include Common Faucet Adaptor For Easy Installation. 100% Factory Tested and Sterilized. It takes out 99% of the chlorine and organic chemicals. It provides enhanced reduction of taste, odor, and color. Protect and prolong the life of membrane.